Home » General Interest » In Politics Why Does Left Mean Liberal and Right Mean Conservative ? We use the terms “Left wing” and “Right wing” when referring to political policies without really thinking about it. But if youu analyse it closely it’s a pretty odd thing to say. There’s even connotations of some distaste associated with each term. Both ‘right and left wingers’ usually uses their opposite other term as a mark of scorn. So how did these expressions come about ? The political affiliation of these two common terms arose during the French Revolution. 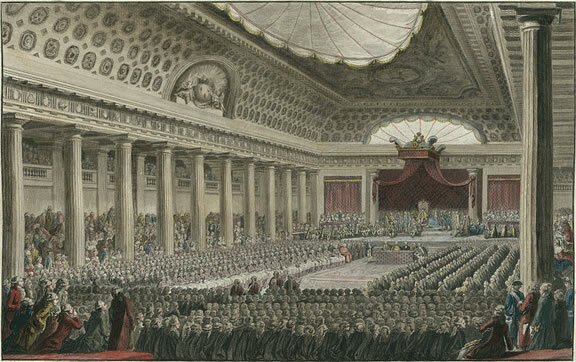 In the 1790s, King Louis XVI was fighting with the Legislative Assembly. Like most modern-day parliaments, seating in the French Legislative Assembly was arranged based on political affiliation. The King sat in front of the assembly. To his right sat the conservative Feuillants who backed the king and believed in a constitutional monarchy. To his left sat the liberal Girondists and radical Jacobins who wanted to install a completely democratic government. However it wasn’t until the early 20th century that Left and Right denoted political affiliation in Britain and the US, and the more politically loaded terms “leftwing” and “rightwing” were not widely used until after 1960. ⇒ In the UK Parliament the Chamber is a rectangular shape so the Government and the Opposition can face each other. The Government sits on the benches to the right of the Speaker. The official Opposition and MPs from other parties sit on the benches to the left of the Speaker. So left and right don’t really have the same meaning here as it depends which party is in power. ⇒ In the U.S. House of Representatives the tables have turned: members of the Republican party sit to the left of the House Speaker and members of the Democratic party sit to his or her right.